GETIMAGE Reads unformatted 2D and 3D arrays. 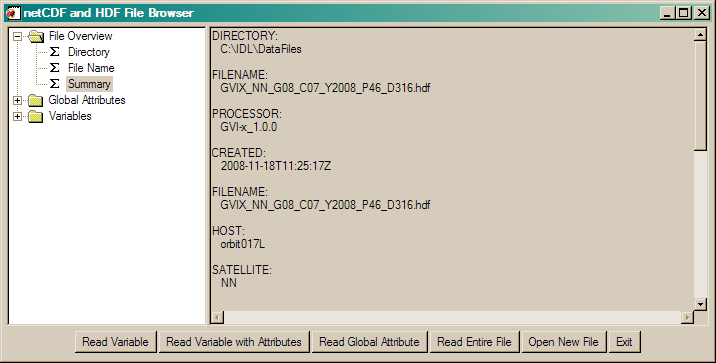 HDFREAD Reads an HDF data file created with HDFWRITE. HDFWRITE Writes an HDF data file. 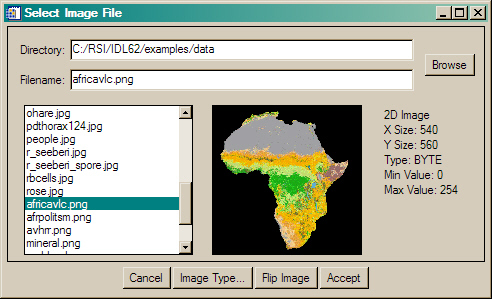 IMAGESELECT An image selection program for images with known formats. NCDF_BROWSER A simplified front end for the NCDF_DATA object and browsing netCDF and HDF files. 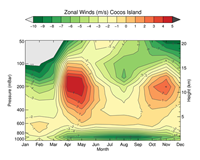 NCDF_COORD Reads a netCDF file to obtain map projection and grid information to produce a MapCoord object. NCDF_TOOLS A zip file of IDL programs for creating, browsing, and reading netCDF files. The Coyote Library is also required. A pop-up form widget for selecting and reading binary data. 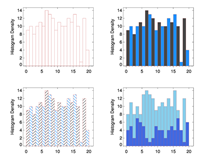 The data files can be either two- or three-dimensional data sets, with or without headers, in XDR or simple binary format. 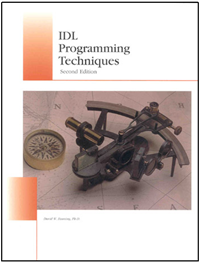 This program is especially useful with the training files used in IDL training courses. This is an example program that shows you how to read an HDF file that is created with HDFWrite. You will learn how to get file and data set attributes out of the HDF file in a general way, how to access a particular SDS, and how to access and use the color palette that is stored in the HDF file. This is an example program that shows you how to write an HDF file that can be read with HDFRead. You will learn how to set file and data set attributes in the HDF file, how to store different types of SDS data, and how to store a color palette in the HDF file. This program is a selection/browser widget for reading known format (e.g. TIFF, JPEG, etc.) images. File formats supported are listed in the table below. A thumbnail image is displayed, along with information about the image, before selection is determined. 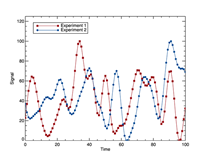 The image is returned as the result of the function. 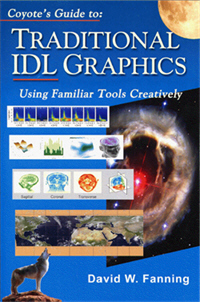 The program has been updated on 26 February 2006 to read FITS images, if the NASA Astronomy Library is on your IDL path. File type is determined by file extensions. The following file types and extensions are supported. The purpose of this program is to allow the user to browse and read the data and metadata in netCDF or HDF files. This IDL procedure is an easy-to-use front end for the NCDF_DATA object, described below. This gives you access to a great deal of NCDF_DATA object functionality, without having to be familiar with, or use, object programming. 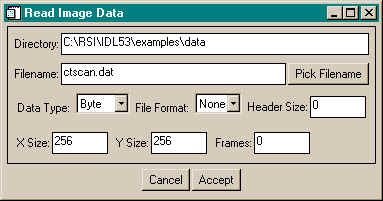 Data and metadata can be read from the file directly into IDL variables at the main IDL level through this graphical user interface. The user has a choice of reading single variables or the entire file. New netCDF or HDF files can be loaded with the click of a button. 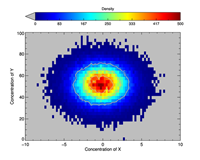 Note, only HDF files with Scientific Datasets (SD) can be read with the program currently. The purpose of this program is to read a netCDF file to obtain map projection and grid information in order to produce a MapCoord object for image navigation and annotation. Tested on CF 1.4 compliant files. A collection of IDL programs for creating, browsing, reading, and copying netCDF files. Included in the collection is NCDF_File_Examples, an example program that shows you to how create a netCDF file, copy the contents of this file to another netCDF file, and how to read the netCDF file to do something useful in IDL. Based on a lot of good work by Mark Hadfield, Ken Bowman, Paul van Delst, and others, these are the programs I use professionally to work with netCDF files.